Even if you don’t know much about the history of Hollywood, you’ve probably heard of The Brown Derby, a legendary restaurant famous for its celebrity clientele. An icon to Hollywood’s golden age, it was a perfect fit for Disney’s Hollywood Studios theme park, and the company opened up what they describe as “an authentic replica” on the park’s Hollywood Boulevard. Along with architecture and decor, Disney’s Brown Derby features some signature dishes from the original restaurant including The Brown Derby Grapefruit Cake. The original Brown Derby Grapefruit Cake recipe is a secret, but at one point Disney put out a version for the home cook. 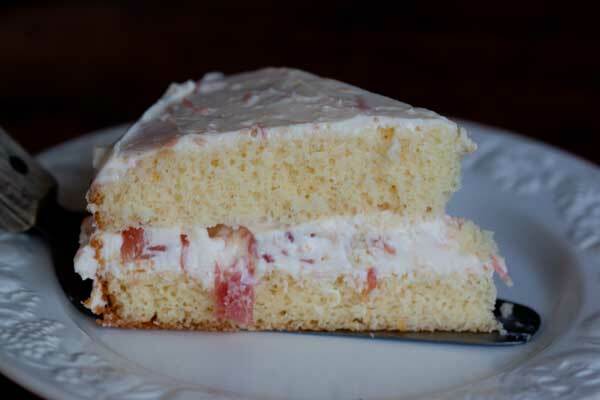 The “copycat” version is a small chiffon cake that’s split horizontally, filled with grapefruit segments and covered in a grapefruit flecked cream cheese frosting. I made it 10 years ago back when there weren’t a lot of pictures of what it’s supposed to look like or interpretations of the recipe. Luckily that’s changed, and there are now several versions floating around. Along with the Disney version which calls for an ungreased 10 inch pan, a highly rated version is Paula Deen’s, which is almost the same but made in a greased 9 inch round pan. I wondered which version was correct. Should It be baked in an ungreased pan chiffon cake style (so it can cling to and climb up the pan walls) or in a greased 9 inch cake pan. Long story short, I tried making the cake both ways — first in an ungreased 9 inch springform then in a regular 9×2 inch cake pan generously greased and lined with parchment.As expected, the springform version rose higher and lighter, but the greased cake pan version was better as it was easier to deal with and seemed to hold the frosting and fruit a little better since it was just slightly denser. Another question I had along the way was whether I really needed to use canned grapefruit. The recipe calls for grapefruit zest so you can’t make the cake without having at least 1 actual grapefruit. Why buy canned when you can just section some grapefruit pieces and use those? After making the cake two ways I’m guessing its because the canned grapefruit is a little sweeter and more uniform in shape plus the convenience factor of not having to remove the membrane. It’s up to you which way to go, but I actually thought the fresh grapefruit tasted better and probably wouldn’t bother with the canned. Either way, it’s a fun little cake and very refreshing. 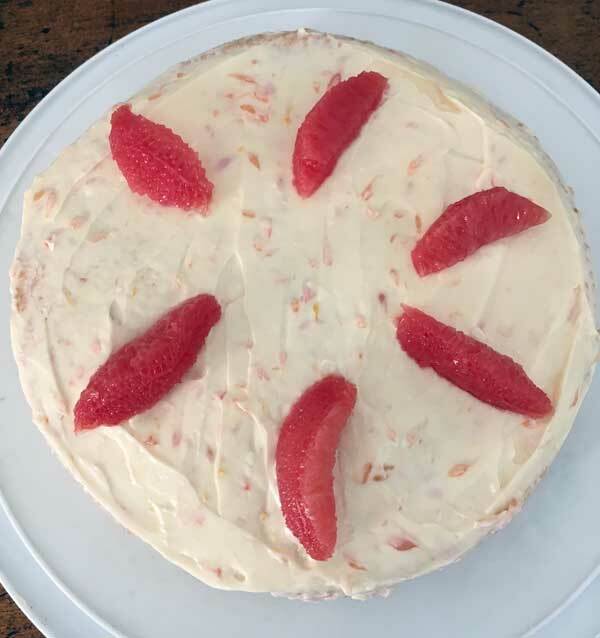 The cream cheese frosting is a bit light in that it doesn’t contain butter, and the base of the cake is also fairly lean. There’s also quite a bit of citrus flavor. I did add a tad of vanilla because I like it in almost everything, but other than that I didn’t make a whole lot of changes. That being said, I’m pretty sure the restaurant version is not exactly like this and will have to go try it one day at The Brown Derby. Revised version of the Brown Derby Grapefruit Cake recipe served at Disney. You can substitute fresh grapefruit for the canned and leave out the food coloring (I actually forgot it!) if desired. Preheat oven at 350 degrees F. Grease a 9x2 inch round cake pan and line with strips of parchment. Dust with flour. Make a well in the center of the flour and add water, oil, vanilla. zest, grapefruit juice and egg yolks; mix with a heavy duty scraper until well blended. In a separate bowl, using an electric mixer, beat egg whites and cream of tartar until whites are stiff but not dry. Gradually fold egg whites into flour mixture with a rubber scraper until blended. Pour batter into the pan and bake for 25 to 27 minutes or until cake springs back when gently touched with a finger. 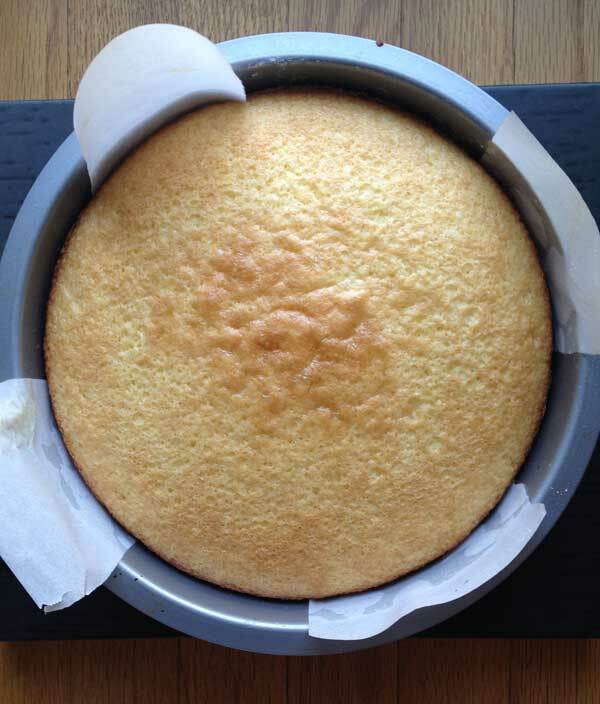 Remove the cake from the oven and let cool slightly, then turn the cake from the pan and let cool completely. Prepare the icing while cake cools. Beat cheese until fluffy. Gradually blend in sugar, then add grapefruit juice and zest. Mix until well blended. Add food coloring if using. Crush several grapefruit sections and add to frosting. Use however many you like. With a serrated knife, split the cake into two layers. Spread frosting on bottom half of cake. Top with some more chopped up grapefruit sections. Cover with second layer of cake and frost top and sides. Garnish with remaining grapefruit sections. If you have a kitchen scale you can skip sifting the flour and just weigh out 5.25 oz. If you don't have a scale and are using cups, it's important to sift so that the flour will be well-aerated and your 1 1/2 cups of flour will be nice and light. 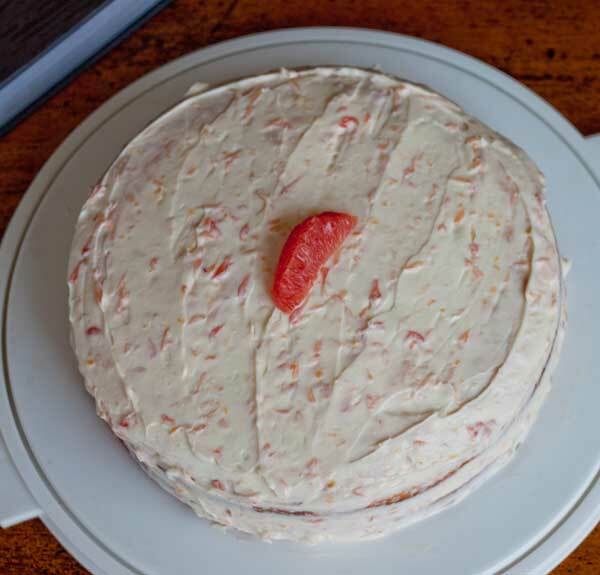 The original frosting called for 12 oz of cream cheese, 3/4 cup of sugar and less grapefruit zest and juice. I used the original amounts but just barely had enough frosting and recommend going with 16 oz of cream cheese, 1 cup sugar, etc. etc. as written so that you'll have plenty of frosting.